Authored by GB_2 on Mar 10 2019, 10:42 AM. 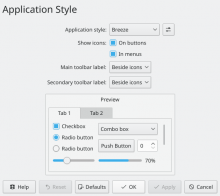 Apply the KDE HIG, merge the two tabs into one page and make the KCM look better. Open the Application Style KCM. Rename style preview checkbox from "Check box" to "Checkbox"
Is that "Application style" combobox long enough to accommodate longer strings like "MS Windows 9x"? Yes, it adjusts itself to the width of the longest item automatically. Can it have the same default width as the toolbar text location comboboxes? Yeah, I can try that. 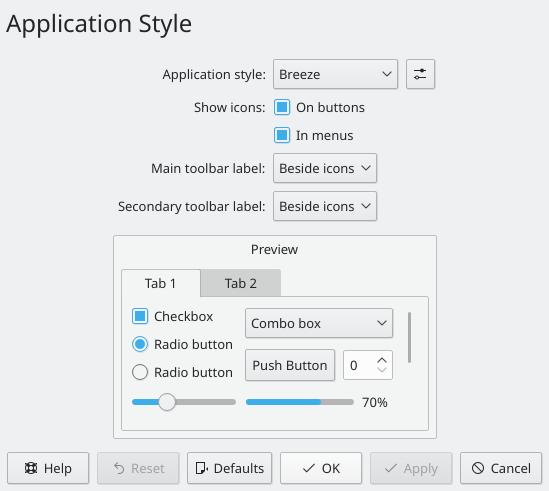 Check if configure button should be enabled after clicking "Defaults" and rename "cbStyle" to "comboStyle"
For some reason I couldn't get it to work, I'll just leave it how it is now, I think it looks fine. Is there any way that we can make the preview window have more right and left margins? When presented like this, it seems like it is actually another module that users interact with. One more concern: Why are there two seemingly unrelated radio buttons in the preview? Wouldn't just one button be enough? The first radio button should be activated, thanks for noticing that. "This module allows you to modify the visual appearance of applications' user interface elements"
Thanks! Code is sane too.